Kindergarten students TT Askew, Alicia Garcia Elvira, Haylen Lovelace and Mercy Nelms are students in Jakeli Swimmer's Cherokee language and culture class at Robbinsville Elementary. Liz Schlemmer reports on efforts to keep the Cherokee language alive in parts of western North Carolina. Jakeli Swimmer keeps a little black notebook nearby while he teaches. The worn pages of the spiral notebook are covered in his scrawled notes and doodles of legends he has heard since childhood. The notes are vocabulary he has written in English, his first language, and words he’s learned in Cherokee, his native language. He makes a new entry for each new Cherokee word or phrase he learns, like ᎶᎳᏏᏁᏕᏍᏗ (pronounced Tsal-shin-de-sdi), which means “be careful.” He says the book is his lifeblood. Jakeli started the notebook five years ago, but he began hearing Cherokee from his grandma as a child. He wishes he’d spent more time learning from her when he was young, when he could have soaked up her words through immersion. “There was some days that Grandma would speak Cherokee and it’d just kinda click,” he recalls. He remembers the way she’d speak with hand gestures to guide his understanding. Today, his grandmother Amanda Swimmer is 97 years old, and Jakeli is part of a generation of young Cherokee adults who struggle to reclaim the language and pass it on. Jakeli is among the members of the Eastern Band of Cherokee in North Carolina trying to save their language from extinction. He estimates that in a worst case scenario, the Cherokee language could have only 30 more years before it is practically extinct. The youngest fluent Cherokee speaker in the Eastern Band is 29 years old -- close to Jakeli’s age -- but most are over 50. The UNESCO Atlas of the World's Languages in Danger labeled the eastern dialect of Cherokee as severely endangered in 2010. The language is one of 135 indigenous languages in the United States that UNESCO considered to be endangered. The tribe has tried many initiatives to sustain the language -- while fluent speakers dwindle. The teachers working on those efforts say their mission is a lot bigger than any single program or summer camp or phone app. It’s an effort that spans generations. 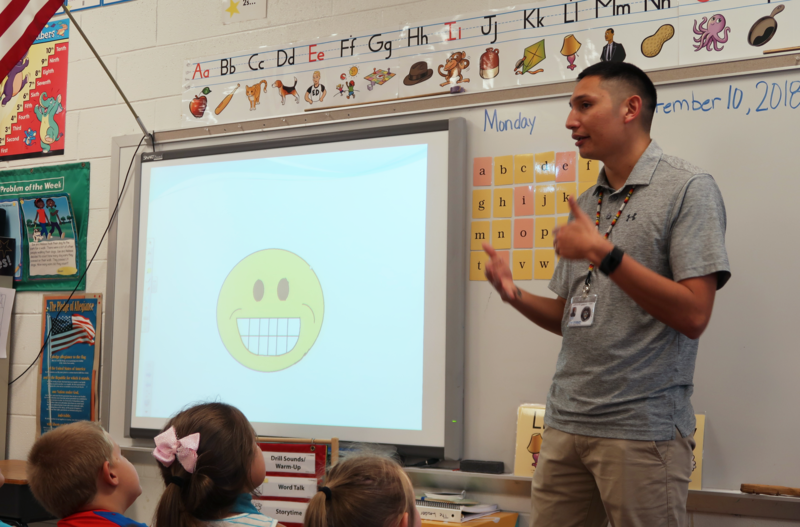 Jakeli Swimmer teaches his weekly Cherokee language and culture class at Robbinsville Elementary in Graham County, North Carolina. Jakeli teaches Cherokee language and culture at a public elementary in the small town of Graham, North Carolina. It’s near the Tennessee border and just outside the Cherokee’s Qualla Boundary territory. Every day, Jakeli moves from class to class, giving a short lesson that teaches Cherokee words through storytelling. He illustrates Cherokee legends using his own homemade motion-graphic presentations, and inserts vocabulary words in the story. 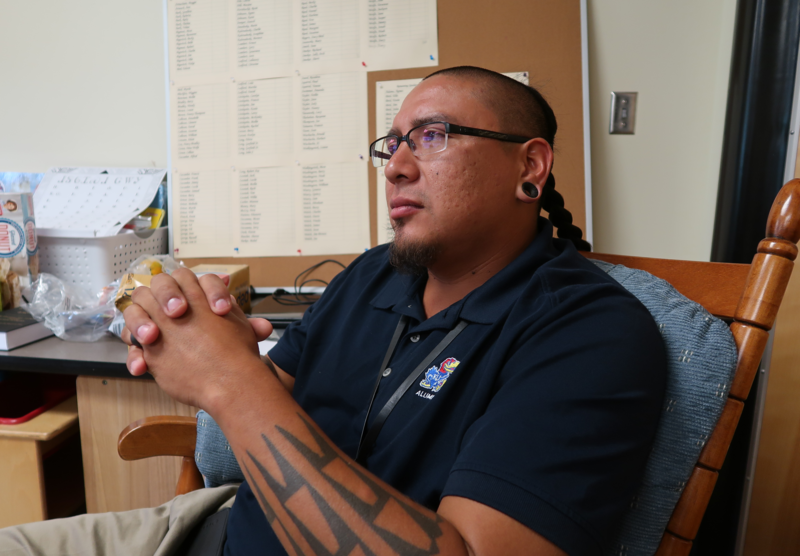 Jakeli says he’s grateful for the opportunity to teach in a public school where enrolled tribal members are the minority, but he only sees each class for 30 minutes a week. Most of the students won’t receive Cherokee language classes again until high school, if they choose that elective over Spanish. When this school year began, he found out his fifth and sixth grade classes were dropped so students could use the time to receive tutoring in state standards. The cancellation is a small setback, but one Jakeli takes in stride. Still, what weighs on him is that after thousands of years of Cherokee people speaking their language in the mountains of what is now North Carolina, he could be among the last. Jakeli is on a slow and steady mission to keep his heritage language alive for younger generations, like his three daughters. “I love when they’re little, their grandmother picks them up and she says all these little things in fluent [Cherokee]. It’s just small things like ᏙᏳᏍᏗ ᏣᏚᎵ ᎤᏅᏗ (pronounced Doyusdi tsaduli unvdi) ‘Do you want milk?’ And I think it’s great, and their eyes light up,” Jakeli said. Jakeli believes saving the language is about bridging that gap between generations. Forty miles away in Cherokee, North Carolina, Jakeli’s older brother Micah Swimmer is working on the same mission. Micah leads a group of four young adults and four, older fluent Cherokee speakers in an all-day language session. “I think this is the most important thing right now, teaching adults, because if we don’t teach these adults how to talk, you can’t make the kids talk Cherokee,” Micah said. Micah oversees a class of adult Cherokee language learners at the New Kituwah Academy in Cherokee, North Carolina. Behind him is a bulletin board he made that displays the names of the 226 remaining fluent Cherokee speakers. Micah keeps a list of the remaining Cherokee speakers on a bulletin board, a looming reminder that time is limited. There are 226 names on printed sheets of paper tacked to the corkboard. “That’s all we have out of 16,000 enrolled members; that’s all we have left that are fluent speakers,” Micah said. He says he used to keep the list in a more prominent place in the school. When a speaker died, he would choose someone different to mark out their name with a red pen. He says he wanted to show a sense of urgency. But he says, after a while, he was told to take it down, because it started looking like a hit list. Some of those older speakers, when they were students, were discouraged from speaking Cherokee in public school. But they spoke it at home, and the language survived. Now the tribe works to teach children in school. Micah’s classroom is tucked away in a private Cherokee immersion school that teaches enrolled members of the tribe as young as infants. The youngest children play in a nursery with brightly colored words written in syllabary, the Cherokee alphabet, displayed on the walls. 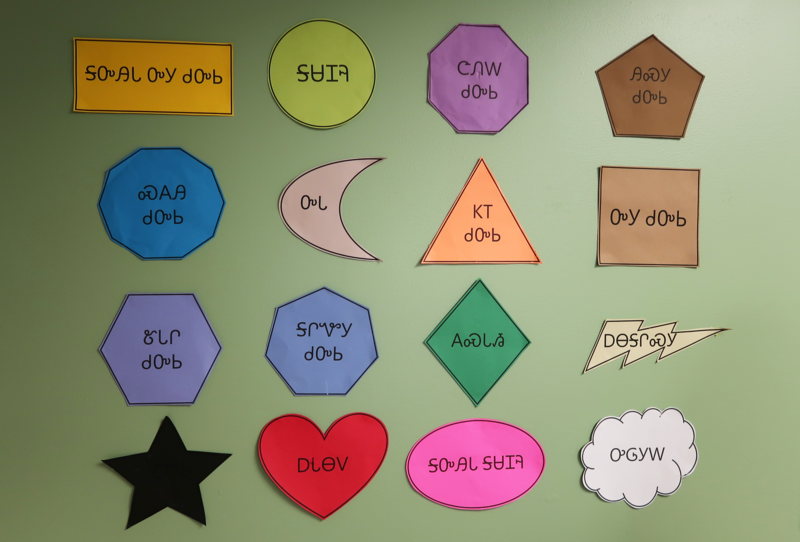 This display of shapes with their Cherokee names written in syllabary is on the wall of a pre-school room at the New Kituwah Academy, a Cherokee language immersion school in Cherokee, North Carolina. When the tribe helped to open the New Kituwah Academy, people imagined it would be the cure to revive the language -- but Micah says he hasn’t had the honor of adding anyone to the list of speakers yet. It’s getting harder for the school to maintain immersion. It’s hard to hire truly fluent speakers as they age, harder for kids to keep up their language skills outside of class when their families don’t speak much Cherokee. And that’s under the best circumstances. On a recent afternoon back in Graham County Public Schools, Jakeli Swimmer moves forward with a lesson on weather. He teaches the same lesson all day, moving from kindergarteners to fourth graders. He’ll tweak the lesson and re-teach it to the same group of kids next year. Third-graders Skylen Adams and Aiden Conley react to Jakeli Swimmer's Cherokee lesson on words for weather. Jakeli makes most of his classroom materials. He’s lent his voice to a Cherokee language phone app. All these tools had to be created by the local community -- another struggle that someone teaching Spanish or Mandarin doesn’t face. “We have all these tools, and all these things around us -- recording devices, phones apps and yet, we’re still struggling to break that surface. We’re still at that tip,” Jakeli said. Jakeli says recognizing the slow pace of progress can be hard to swallow. Anyone who has seriously taken on the task of learning a second language knows it is a long journey -- whether you’re learning a foreign language or a heritage language you’ve been exposed to since childhood. It’s like being Dorothy dropped in Oz, but it’s still black and white when you get there. For every new word you learn, that object lights up in technicolor -- but it takes thousands of words to make the whole landscape shimmer. Jakeli has been on his journey to learn Cherokee for decades. Now he’s hoping to inspire other tribal members to take on the same quest. Maybe even his own daughters. “Yesterday, my little girls were in the grocery store over there, and I was telling them, ᎨᎾ! (pronounced Ke-na) Come here! ᏄᎳ (Pronounced Nu-la!) Hurry! Hurry! And my little girl is saying ᎨᎾ! ᎨᎾ! to her little sister, so that little bit made my day,” Jakeli smiles. Jakeli’s oldest daughter is in kindergarten now, and has him as a teacher. She’s starting to take a real interest in learning Cherokee. Meanwhile, he keeps at it too, one rescued word at a time.